← Are We Being Too Hard on Ourselves? Not sure what these are called (anyone?) but we saw them on our walk today. Apparently, after all these weeks and weeks of blistering heat, rain is on its way. The lawn is yellow, the plants are shrivelling up and it’s too hot to sleep. We need it! It’s been a football-focussed, outdoor-living, Love-Island-watching few weeks (don’t judge me!) and I haven’t done much writing, I must admit. 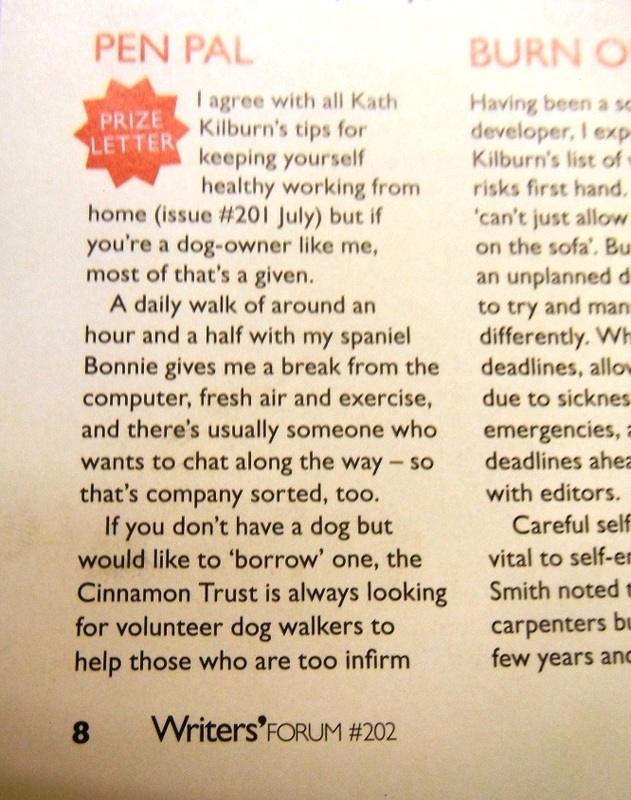 But I did manage to send a letter to Writer’s Forum magazine and it’s the ‘Prize Letter’ in this month’s issue, which came as something of a surprise! Yes, the pic is a bit blurry (it’s not your eyes) but honestly, I’ve just faffed around for an hour trying to download photos and I’m afraid (as per my last post!) I’ve decided it’s ‘good enough’. I was responding to an article in last month’s issue by Kath Kilburn, in which she advised writers on how to keep healthy while working from home (go for a walk, get fresh air, interact with others. That kind of thing). My response was, that although I agreed with all she said, actually (*smug face*) if you have a dog, you do all those things without thinking about it. I also threw in a couple of references to the Cinnamon Trust and BorrowMyDoggy.com for those who don’t have a dog of their own but would like to walk one. I wrote the letter (dashed off in less than five minutes) because it was something I feel strongly about, something I know about, something I’m interested in. And I thought no more about it. And there you go – it was not only published but I won a prize for it too (a year’s subscription to the magazine), so someone (the editor!) thought it was good. It was only a little letter but perhaps there’s a lesson to be learned there (I’m telling myself, too): write from the heart, write what you know and what you’re passionate about and not only will the words flow but you might – just might – strike a chord with someone. It’s making me think, at a time when I definitely need to rethink my writing plans, given all the recent kerfuffle with Woman’s Weekly, who are now demanding ‘All Rights’ when they purchase fiction. (see the womagwriter’s blog if you want more info on that). This entry was posted in Bonnie, Cotswolds, Magazines and tagged Writers Forum. Bookmark the permalink. Raining here. Right now!! Smells lovely. I have rain-envy, Penny! Would love a night off from watering the pots…! The first image looks like what we call yarrow around here (Virginia). It grows in pretty tough soil along the edge of roads. I have a dog, too, and he definitely helps keep me healthy for all the reasons you mentioned! I think it is yarrow, Priscilla (I googled it), so thank you! I really should learn the names of all the wild flowers and plants I see on my route! I’m good with names of birds but not so good at everything else! I thought it was hogweed, Helen. Yarrow is out now as well. The leaves are the best way to tell them apart. I am learning a lot from #wildflowerhour on Twitter at 8-9pm on Sundays. Eek, I hope it’s not hogweed – isn’t that really poisonous?! I too walk the dog everyday, anything from half-an-hour to two hours. I don’t often meet anywone but it does give me a chance to think, and I often come up with some good ideas for stories or sort out some small problem that is nagging in my head – not necessarily to do with writing. I often wonder what will happen when the dog is no longer with us (she’s nine now) but think I will walk by myself or borrow a dog. I don’t think I will ever get another of my own because, much as I love her, having a pet of any kind is a tremendous tie and I like to travel and go away often. I’m also enjoying my bike, so thinking of getting a contraption to either take her with me on a lead or have her in trailer. What fun that could be! I agree, Ninette, it is a tie, having a dog. Just this week, we were both going to be out for most of the day and I had to race around, taking Bonnie for an early morning walk and then having to dash back from my outing (and negotiate with our kind neighbour to let her out. And then I worried because he took her round to his place and I wondered what chaos she might have been causing…eg: they have a stream running through their garden and I had visions of her chasing all the ducks!!. Apparently she behaved ‘impeccably’ but who knows the truth…?!). Couldn’t imagine life without a dog now, though. When she’s not there, I miss the cuddles as much as anything! Agree that walking is great thinking time. Something to do with the rhythm, I think. P****d it down in Nottingham & Derby last night. Enough to interrupt the cricket anyway. Didnt last long though. Yes, Keith, my parents are in Lichfield and they had lots of rain but still nothing here for us! From the look of the leaves it is hogweed. Which isn’t dangerous! It’s very common. 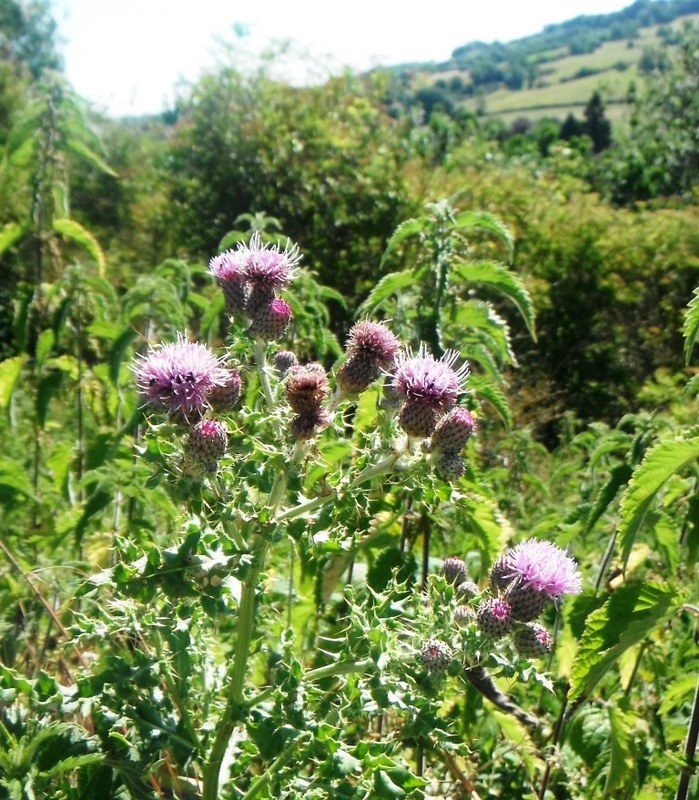 The rare Giant Hogsweed does have poisonous sap but I’ve never seen it. Yarrow is usually a lot smaller and has kind of frilly leaves, a bit like a bottle brush! 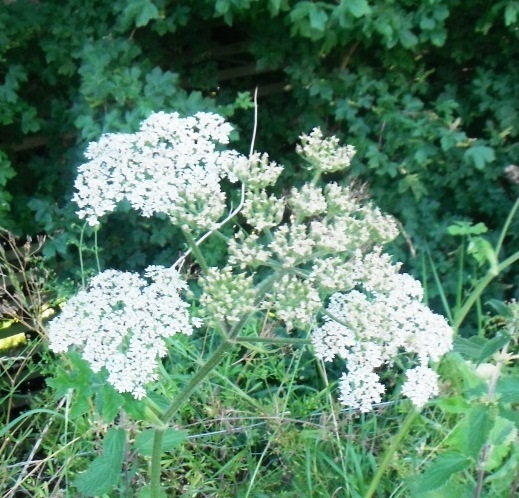 Queen Ann’s lace (cow parsley) is similar too but with feathery leaves and the flowers are usually over by now. Thank you, Chloe! I have seen rare giant hogsweed on a recent boat trip along the Avon in Stratford! The guide pointed it out to us and said that it can blind you – eeek! I’ve been quite lucky with letters to various magazines, too. Womags seem to like it if you send a pic, too. I did one about shaking a printer toner cartridge to get a few more pages out of it, even when you think it’s empty, and won enough to buy a refill) I love the title to your letter, btw! Yes, it’s good isn’t it (‘Pen Pal’ for anyone who’s wondering). But I can’t take the credit for it. The editor made up that title (or whoever set/laid out the page! ).